Payroll Services - James Dee Johnson & Company has a range of payroll services that you can customize for your business including direct deposit. We process and cut payroll and tax checks. If you are interested in quarterly payroll tax report filing, we do that as well. Your company will receive professional checks and check stubs for each employee, state unemployment reports, earnings reports, a payroll journal, and any other reports that you, the state, and any taxing authorities may require. Businesses have enough to worry about without piling on the hassle of time consuming payroll responsibilities. In order to ensure proper withholdings from employees' paychecks, business owners must pay close attention to avoid making mistakes and suffering expensive government penalties. 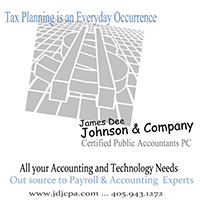 Should you choose to outsource payroll with James Dee Johnson & Company, your business will receive professional checks and check stubs for each employee, the prepared quarterly 941's, state unemployment reports, earnings report, a payroll journal, and any other reports the taxing authorities require. At the end of each year, for an additional fee, we will also prepare the W-2's.